Smoke detectors save lives. If a fire breaks out in your home at night, the absence of a smoke detector could mean that your family remains asleep as the fire spreads across your home. This lost time can leave you or your children with no safe route of escape. A properly functioning smoke alarm could have awakened you in time to escape or save your family. For these reasons there are now smoke detector requirements in all new construction. Knowing where they must be located is an important piece of information to know. Ensure you have smoke detectors properly installed so you can get your family out fast. All new homes must have at least one smoke detector located on each level of the home. In other words, a three-story home would have a minimum of three detectors, while a single-story home may only have one. While other factors will likely force the required number higher, this is the base rule for new homes, according to the US Inspect website. Basements also count as a level for these requirements and should also have one detector minimum. All bedrooms should have one smoke detector installed. The National Fire Protection Association website says all bedrooms should have one smoke detector, and, if there are separate sleeping areas in a bedroom, both areas should be equipped. In addition, there should be additional smoke detectors outside of bedrooms. These smoke detectors are in addition to the detectors required for each level of the house. Some floors in a home have no bedrooms, but determining where to install the single smoke detector to fulfill the level's requirement should not be random. The main detector on each level should be in a living area, according to the US Inspect website. Family rooms or living rooms are the typically recommended place to mount a smoke detector for the best results. Installing the detector near forced-air registers, windows and fans could blow smoke away from the detector and cause a delay in the alarm sounding. When you have determined the approximate areas of the rooms that must have a smoke detector, you only need to know the specific requirements for effective installations. You should install the smoke detector on the ceiling or high on a wall since smoke rises. You should also keep ceiling-mounted detectors at least 4 1/2 inches from the nearest wall and wall-mounted detectors at least 4 1/2 inches from the ceiling. If you have a cathedral or vaulted ceiling, ensure the smoke detector is mounted near the very top height. 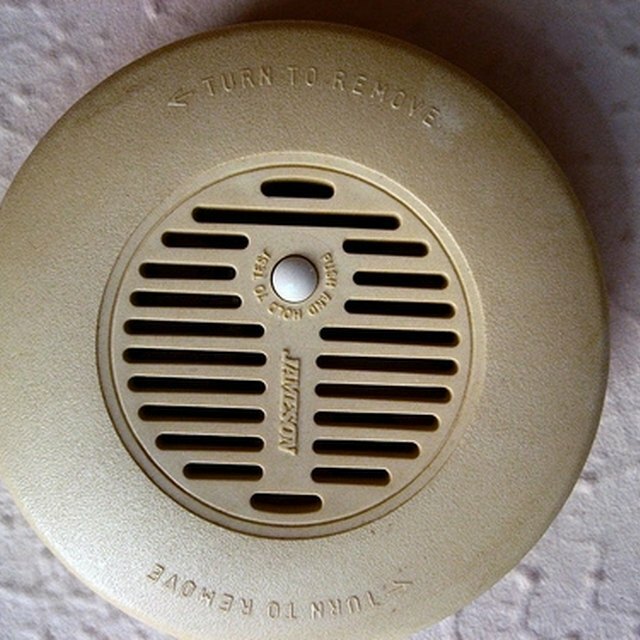 Positioning the devices in this way will reduce the chance that smoke will roll away from the detector and not cause the alarm to sound. New Room Construction: How Many Electrical Outlets? Can I Build a Second House on My Lot? What's a Non-Conforming Basement Bedroom?